Librarians can sometimes suffer unfairly from stereotypes. But footage like that below suggests there could be much more to your average librarian than might initially meet the eye. I certainly wouldn’t like to be on the receiving end of a late fine from any of these warrior librarians! See how long you can stifle your giggles. And rest assured in the knowledge that the book-cart-drill-team contest will be held again this year at the ALA annual conference. The media faces constant criticism from medical specialists and advocacy groups whenever it trumpets the latest new wonder drug to cure any form of cancer. Many spurious claims have over the years been splashed across the UK Daily Mail’s front page, prompting backlash from organisations such as the National Health Service, Cancer Research UK and even the appearance of a Facebook group with more than 40,000 members criticising the Mail’s cancer cure/cause agenda. But the recent news that pharma giant Roche was revising its position on Avastin after the drug failed in a late-stage study, evaluating the blockbuster as a treatment for advanced stomach cancer, was an example of where the stock market, media expectations of a miracle cure and a pharma giant collided. He (Lotery) said it was the first time the drug had been used to treat the rare genetic condition(SFD) which caused the two patients, both in their 30s, to suffer blurred vision and a general deterioration of sight. Avastin has already been trialled successfully in conjunction with chemotherapy in ovarian cancer sufferers so the prospect of another potential target would be welcomed by the shareholders but more importantly, by sufferers of the targeted conditions. But this is a situation where the media needs to tread carefully and wait for stronger research to appear before latching onto another cure-all drug. On another cancer story, Yoshio Yamaoka, an F1000 Medicine faculty Member from Japan, has looked recently at the use of various drugs to treat Helicobacter pylori infection, which often leads to gastroduodenal ulcers, gastric cancer and associated diseases. Posted in Communication, f1000, FMs, Medicine, Random, Science | Tagged: avastin, cancer, pharma | Comments Off on Is it a cancer drug or not? Sometimes there’s a real life-changing thrust to blog posts, that drives at the heart of a pivotal issue in modern society and make people question their motives, passions, opinions or even educational goals. But seeing as we’re all coming down off a post-Oscars high, let me preempt your own judgement by rating this one as an Inglourious Basterds compared to the Hurt Locker of more worthy blog scribblings. Actually, it’s really more of a Valkyrie than QT’s latest effort but then Tom Cruise never won any awards for his ability at copying accents (and it obviously wasn’t nominated for the 2010 awards so it’s less zeitgeisty). Anyway, my point is to direct your eyes to the picture of the man on the left, much-respected Stanford neuroscientist and f1000 Faculty Member Robert Sapolsky. 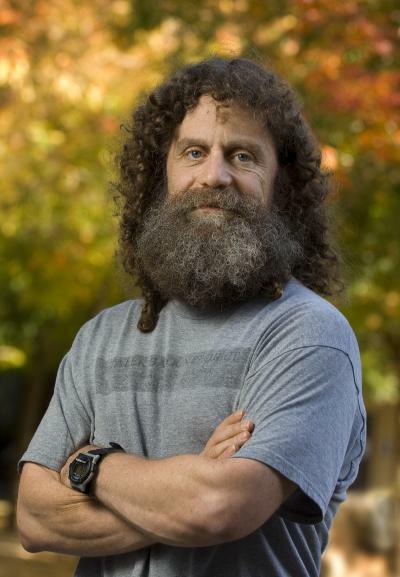 With a beard that would make Hagrid feel ashamed, Sapolsky must be a delight as a lecturer. He’d also make a great magician with no need for a top hat either. Sapolsky is a seasoned reviewer for f1000 and contributed a very positive review of a recent paper in Nature which discussed Prejudice and truth about the effect of testosterone on human bargaining behaviour. The crux of the paper was in a press release we put out today but the first emailed responses from journalists focused not on the weighty issues being discussed but of course, the accompanying photo above. In one reporter’s words, it encouraged her to ask for more information on him as “I’ve been meaning to do somethign (sic) on weirdy beardies for a while”. This is not the first time we’ve discussed hirsute scientists and our friend Joanne Manaster has a similar penchant (purely scientific) for bearded biologists. But it reinforces once again how much we should respect a scientist who sports this look: if he shows half as much commitment to research as to beard growth, a cancer/malaria/Xbox-related RSI cure is surely not far away. *it’s ok, I cringed while writing the headline as much as you probably did reading it. To me it felt like the title for a bad 90s C-grade comedy starring a faded stand-up comic. Then I did an IMDB search (I’m writing this in real-time, so the punchline could be a fizzer) and whaddya know? It was closest in wording to a bad Canadian comedy flick , a 1912 black and white romantic drama and best of all, the ridiculously titled, Michael Flatley: Eire Apparent, about the most arrogant Irishman to ever pull on a pair of tights. Riverdance fans, I’ll meet you in the car park if you want to take issue with that assessment. So, we know that tumours have this nasty habit of sending out malignant cells into the rest of the body. They break off from the primary site and get into the blood and lymphatic systems, occasionally washing up in convenient organs where they can settle down and create new tumours, or metastases. This is partly why cancer is so difficult to cure: you can cut out the original malignant growth, zap it with X-rays and take all sorts of evil drugs (‘evil’ because they are designed to kill cells, and you’re made up of cells; and discrimination between the cancer cells and normal cells is a huge problem); but if one metastatic cell survives, you have to start all over again. And if it’s managed to find a home deep in a bone, or the brain, or somewhere equally inaccessible, it’s game over. Tumor self-seeding could explain the relationships between anaplasia, tumor size, vascularity and prognosis, and local recurrence seeded by disseminated cells following ostensibly complete tumor excision. ‘Ostensibly complete tumor excision’—that’s right, because no matter how good your surgeon is, you can never be sure you’ve cut every last bit out; or that some cells haven’t already gone walkabout. The good news is that certain cytokines derived from the tumour, IL-6 and IL-8, act to attract the circulating cells, and that they get back in via the matrix metalloproteinase collagenase I (MMP-1) and fascin-1 (it’s the actin cytoskeleton again! These guys get everywhere). If we can find a way to selectively block these pathways we should be able to start thinking about appropriate therapeutic approaches. Gentlemen (and ladies), start your (grant-writing) engines. It’s been pretty hectic on the twittertubes this week. Following a random conversation at the Scholarly Kitchen I suggested writing papers in 140 characters would be a wheeze. I turned it into a competition, and we had an amazing response. Check back on Monday to find out who’s the lucky winner of a bag of f1000 swag. I don’t have a lot to say about badger culling to prevent/reduce bovine TB (except maybe to say that killing vermin with a high-powered rifle and decent ‘scope is one of the most humane ways of doing this). This trial was undertaken in very specific circumstances and it could be misleading to extrapolate the findings to any future control program. you can be pretty sure there’s a vested interest or extreme prejudice somewhere. Even when the trial shows that there’s no economic benefit. It gets pretty lonely up there in Lincolnshire. Have a good weekend, and I hope it’s full of lovehearts and kisses. Failing that, a beer or three can have much the same effect. A quick round-up of all that’s new and approved in the world of f1000. Or at least my corner of it. 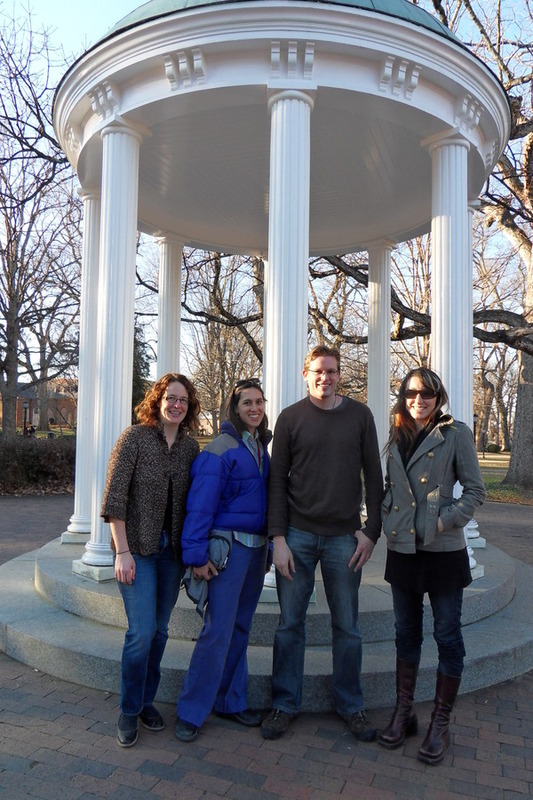 M’learned colleague Steve P is in North Carolina today, hobnobbing with the geeks at Science Online 2010. I decided not to go because I’d done quite a bit of travelling just before Christmas (admittedly not as much as last year), and having had a bit of a nightmare November personally, frankly I thought could do without the hassle. However, those of you who are disappointed at not seeing me (hah!) will get their chance at the London equivalent of Science Online, Solo10. Yup, following the success of Science Blogging 2008 and Solo09 (not to mention Fringe Frivolous), we’re doing it again this year! I know this because I met with the inestimable Lou Woodley earlier today, along with Matt Brown and the Mendeley guys (and Martin Fenner by Skype), to discuss dates and all sorts of necessary weevils. The programme is of course a mere glimmer in the distant sky, but I can tell you we’re looking at a two day (Friday/Saturday) event, and there will be a large collaborative component (indeed, we reckon that we can devote the Saturday morning to an ad hoc unconference). So there’s plenty of scope for plenary and parallel sessions, and you should start thinking about what you’d like to do/see. Matt Brown is likely to be running some pre-conference pub-crawls events, and we’re hoping to have a fringe pre-conference again (although I’m making no promises about me and Flip cameras, one way or the other). Keep an eye on the Science Online London website, and I’ll let you know about hashtags and whatnot in due course. While in Crinan Street I was able to meet with Ian Mulvany (the brains behind Connotea) and discuss a couple more projects. First, he showed me what’s in store for the users of Nature Network: we’re getting MT4! This is a long-anticipated improvement in the platform there, and has acquired something of a mythical status. But I saw it!—on the staging server, at least. The second thing is a little more ephemeral. I’m not at liberty to say much about it, but wouldn’t it be cool if you read an article in your favourite journal, saw that it had been evaluated on f1000, and could make a comment? And that comment then appeared next to the evaluation on f1000? Or maybe you could read an evaluation on f1000 and see what people were saying about that paper all over the web, and join in the conversation? Like Google Sidewiki, but done properly? Other things that have happened this week include us sending test data to PubMed Central. You can draw your own conclusions from that little snippet of information. I’ve also spent quite a bit of time writing and polishing a press release about Sarah Greene. More on that next week; it’s now time to take our Dev team to the pub, methinks. Ah North Carolina, home to sweet potatoes, Krispy Kremes, Pepsi, the Wright brothers’ first flight, old-time music (whatever that is) and Venus Fly-Traps. And for four days in January, also home to the moderately sized gathering that is the Science Online 2010 conference. Skim over the program here and try to contain your jealousy at the thought of all those techy web science people squeaking about how microbiology and microchips can join together in glorious harmony. My cynicism aside, it sounds like a great lineup – though if anyone dresses up in a Spiderman outfit to take the web/science mashup too far, I’ll head straight to the bar. 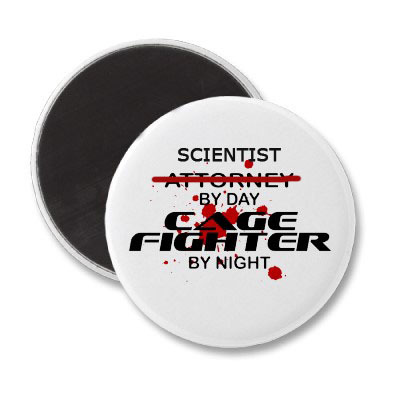 Closer to home, Richard’s discussion on author listings in scientific papers has generated some interesting debate, especially as one academic suggests cage fighting as a method to solve ordering issues. Brings to mind images of a Celebrity Deathmatch between Watson and Crick or Curie and McLaren. Could make the punters more interested than the usual war of words ever does. *As for all the spidey talk, I did rewatch Spiderman 3 last night and, like Avatar, found it a bit too touchy-feely to be a great action film. Though being a long-time fan of Venom, his appearance made it ploughing through worth the glossy Hollywood coating. But I’ll save further movie analysis for another blog in another place. With most of the science media, green movement and world leader attention focused on Copenhagen and climate change right now, it would be remiss of us not to mention a new evaluation which looks at one of numerous papers promising new ways to tackle the greenhouse effect. The reviewer, Robie Macdonald, from the Institute of Ocean Sciences in Canada, looked at a paper in Geophysical Research Letters that discussed stratospheric geoengineering as a way to curtail greenhouse gas emissions. This paper estimates the costs of putting sufficient aerosols into the stratosphere to slow down or reverse global warming. For possibly as little as several billions of dollars per year, one might cool the planet, stall or reverse ice melting, thwart sea-level rise, and increase the terrigenous sink for CO2 through enhanced primary production. MacDonald quite rightly has issues with this proposed technique, as it may on one hand help produce planet-cooling sulfate aerosols but on the negative, as Ars technica also reported, “it would also produce more droughts and worsen ozone depletion. And, crucially, it would do nothing to reverse ocean acidification”. In a time when the media is not quite sure which side of the climate change `debate’ to be on and newspapers are running unchecked stories which deny climate change exists, alongside comment pieces from an unqualified former vice-Presidential candidate (Sarah Palin) to anti-skeptics (George Monbiot), stratospheric geoengineering could take off as the next big thing in climate change reversal (if there could ever be such a beast). *By the way, the suggested methods of using military aircraft and artillery shells to save the planet sound a little too Armageddon for my liking. Is it follow the leader, a heads-down mentality or something more obscure? 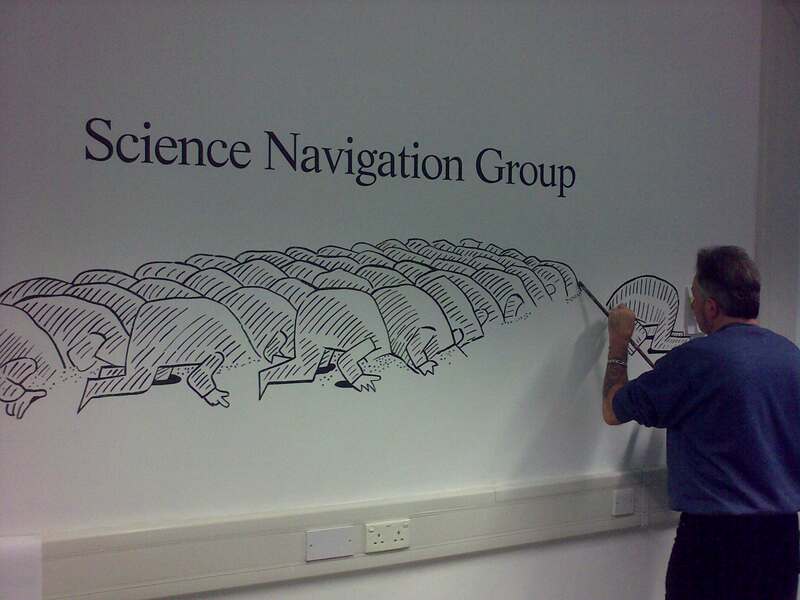 Vitek Tracz, chairman of the Science Navigation Group (of which f1000 is a member), is a fan of compatriot Polish artist Andrzej Krauze, who is known for his humorous calendars and cartoons in the New York Times, New Scientist and Sunday Telegraph. Krauze amused our leader with this cartoon, which Vitek has had reproduced in the f1000 reception area for all to view as they enter. Much speculation has already been thrown around about what it means: follow the leader, keep your head down, look beneath the surface, stick your head in the sand (bit obvious that one). The man in charge is keeping his view to himself. Any suggestions are welcome. Posted in f1000, Random | Tagged: artwork, f1000, vitek | Comments Off on Is it follow the leader, a heads-down mentality or something more obscure?